Respiratory syncytial virus (RSV) is a major cause of lower respiratory tract infection, claiming millions of lives annually. The virus infects various cells of the respiratory tract as well as resident inflammatory cells such as macrophages. Infection activates a variety of cellular factors such as cytokines and the pro-inflammatory transcription factor, NF-kappa B, all of which are important players in the respiratory disease. However, the exact natural route of RSV infection and its etiology remain relatively unknown. In this paper, we test the hypothesis that human corneal epithelial cells, which constitute the outermost layer of the cornea, can be infected with RSV, and that the infection leads to the activation of proinflammatory macromolecules. Corneal swabs obtained from pediatric patients with acute respiratory disease were found to contain RSV at a high frequency (43 positive out of 72 samples, i.e., 60%). Primary corneal epithelial cells in tissue culture supported robust infection and productive growth of RSV. Infection resulted in the activation of TNF-α, IL-6 and sixteen chemokines as well as NF-κB. Three proinflammatory CXC chemokines (MIG, I-TAC, IP-10) underwent the greatest activation. The ocular epithelium is readily infected by RSV. The pro-inflammatory cytokines are likely to play critical roles in the etiology of inflammation and conjunctivitis commonly seen in pediatric patients with respiratory infections. RSV-eye interactions have important implications in RSV transmission, immunopathology of RSV disease, and in the management of conjunctivitis. The respiratory syncytial virus (RSV), a nonsegmented negative-strand RNA virus of the Paramyxoviridae family, is the most important causative agent of pediatric respiratory disease worldwide [1–3]. Various cells of the upper and lower respiratory tracts can be infected by RSV, including cells of the lung and the nasal passage, and cells in transit such as alveolar macrophages [4–7]. Although major progress has been made in our understanding of ocular infections [8–10], the potential interaction of respiratory pathogens with the eye has remained largely neglected in spite of the anatomical connection between the optic and the nasal / upper respiratory tissues. More than a decade ago, Hall and coworkers found that use of eye goggles and nose masks significantly reduced transmission of RSV infection from patients to hospital workers . Moreover, when live RSV was instilled into the eye, nose, or mouth of adult volunteers, more respiratory infections occurred through eye or nose than through the mouth . Recently, conjunctival cells from patients with allergic conjunctivitis were shown to be more likely (23%) to contain RSV as compared to conjunctivitis-free individuals (5%) . Conjunctival tissue from RSV-infected eye also contained elevated levels of IL-4, an interleukin important in hypersensitivity [14, 15]. While these results suggested a susceptibility of the eye to RSV, the infectivity and response of the various kinds of ocular cells to RSV have not been systematically evaluated. Respiratory cells infected with RSV elaborate cytokines and chemokines [6, 16, 17] that play important roles in the inflammatory response of the infected lung [2, 16, 18]. The chemokines are of particular interest because of their role in the recruitment of immune and inflammatory cells to the site of infection. Presently, the chemokines are divided into four subfamilies based on the number and spacing of conserved Cys residues in their primary structure: CXC (α chemokines), CC (β chemokines), C (γ chemokines) and CX3C (δ chemokines), where X can be any amino acid . In the unified nomenclature  the chemokines are viewed as ligands and given names such as CXCL, while their receptor names are indicated by the suffix R such as CXCR; both names are followed by a numeral. A number of immunoregulatory genes require NF-κB for optimal transcription, and a major role of NF-κB in inflammation and septic shock has been well-documented . NF-κB subunits belong to the rel family of proteins  and the best-studied NF-κB species is a heterodimer consisting of RelA (formerly p65) and p50. RSV-infection of alveolar epithelial A549 cells was shown to promote nuclear translocation and activation of both RelA and p50 subunits [6, 22, 23]. In mouse as well as in A549 cells RSV infection led to the activation of NF-κB and this was essential for the transcriptional activation of various cytokine genes [6, 16, 22, 24, 25]. We, therefore, considered it important to determine if similar activation of NF-κB also occurs in HCE cells in response to RSV infection. RT-PCR analysis of ocular surface swabs was carried out as described under Methods. A positive result for RSV was obtained in 43 out of 72 samples (i.e., 60%) taken from pediatric patients who had the common signs of respiratory infection, such as cough, congestion and wheezing (Fig. 1A). In contrast, among 50 control children who did not show any symptoms of respiratory distress, only 1 (i.e., 2%) had a positive signal for RSV in the eye. The samples covered a part of the respiratory disease season in the community (i.e., winter: January and February) as well as a longer non-RSV season (i.e., spring and early summer: March through May). Presence of RSV in children with respiratory disease. (A) Detection of RSV-specific RNA. Collection of eye swabs and RT-PCR amplification of RSV F mRNA and "control" GAPDH mRNA segments were carried out as described under Methods. Only representative samples are shown. Lanes 1–4 = respiratory patients; 5,6 = healthy, uninfected individuals; 7,8 = same samples as 1 and 2, respectively, except that the RT reaction was not performed before PCR. (B) Presence of infectious RSV. Portions of the eye swab wash were added to HEp-2 monolayers to test for RSV growth as described under Methods. The lane numbers represent the same patient samples as in A. The P protein of RSV was detected by immunoblot; note that samples that contained viral RNA also contained infectious virus as judged by the intracellular synthesis of the P protein (lanes 1–4). (C) Syncytia in HEp-2 monolayers inoculated with samples #1 through 6 (the same numbers as in A and B). Note that samples that were RSV-positive (#1–4) in A and B formed syncytia, whereas RSV-negative samples (#5, 6) did not. We used RT-PCR for the initial screening of the large number of samples. However, RT-PCR does not distinguish dead virus or viral genome from live or infectious virus. To ensure that the PCR-positive samples reflected truly infectious RSV, we attempted to culture the virus by inoculating the samples into HEp-2 cell monolayers at low cell density (see Methods). Indeed, when the infected cells were subjected to immunoblot by a specific antibody against the viral P protein, the protein was discerned in nearly all (41 out of 43, i.e., 95%) of the PCR-positive swab samples (Fig. 1B). The fragility of RSV may explain the loss of infectivity in the remaining 5% samples. 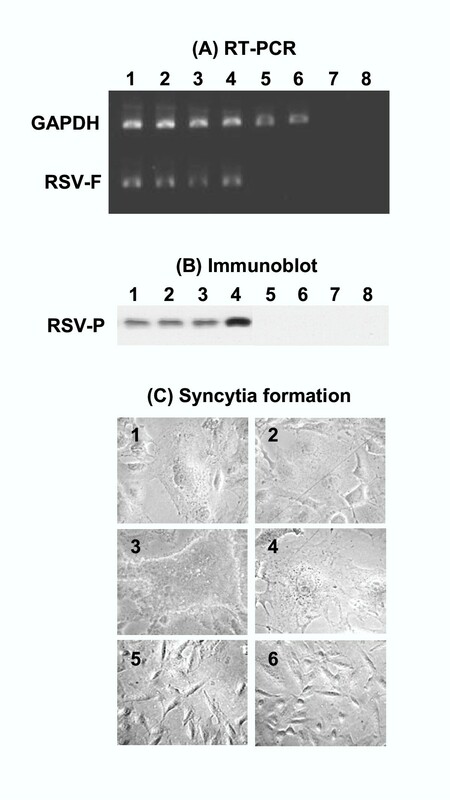 Furthermore, massive syncytia characteristic of RSV growth was seen in all samples that reacted positively in the immunoblot (Fig. 1C). Thus, we conclude that there is a strong statistical correlation (P < 0.02) between respiratory disease (n = 72) and our ability to isolate infectious RSV (n = 41) from the eye of the individual. Since the clinical studies demonstrated the propensity of the eye to be infected by RSV, we tested whether RSV can infect HCE cells ex vivo (in tissue culture). The HCE cells were isolated from human donor eyes, grown in tissue culture, and exposed to the corresponding strains of RSV as described under Methods. As in any negative-strand RNA virus, the RSV genome is anti-mRNA sense and therefore, must first be copied into mRNA before viral proteins are synthesized. In other words, a robust synthesis of viral proteins in the infected cell is indicative of transcription and secondary replication of the viral genome RNA. Thus, to gain an estimate of the viral macromolecular synthesis, we measured the viral phosphoprotein (P) by immunoblot analysis . As presented in Fig. 2A, measurement of extracellular infectious virions showed a sharp rise following a lag phase characteristic of a typical viral growth cycle. Fig. 2B shows that robust expression of the viral P protein also occurred in a time-dependent manner post-infection, consistent with viral gene expression. Finally, in the late phase of infection (at 60–72 hrs p.i.) the RSV-infected HCE cells showed extensive syncytia characteristic of RSV growth (Fig. 3). 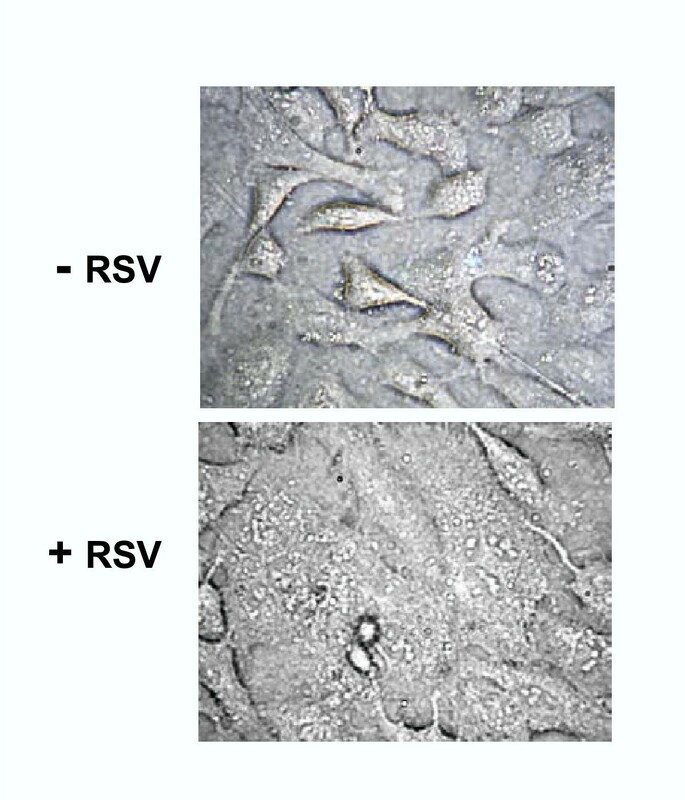 To sum up, HCE cells supported RSV multiplication leading to infectious progeny virions. RSV growth in HCE cells. 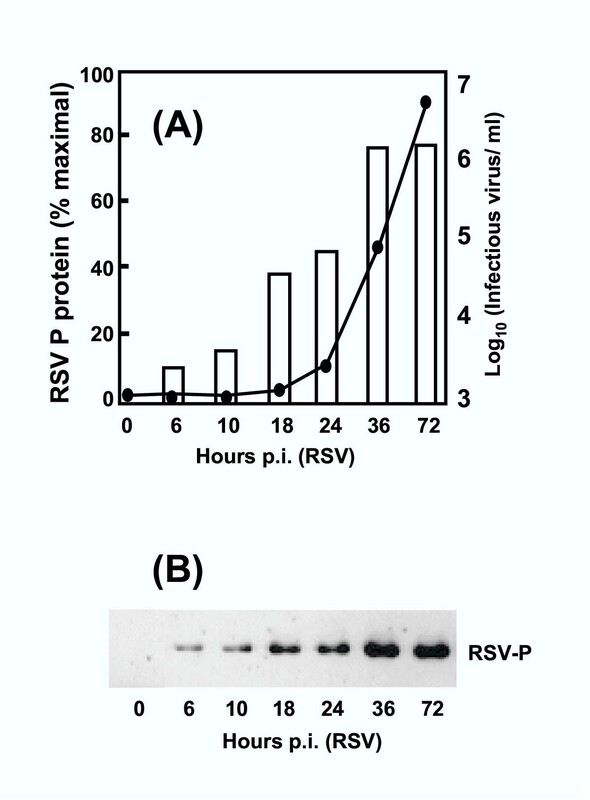 Growth was measured by (A) liberation of infectious virions and (B) synthesis of RSV P protein. At indicated times p.i., the released progeny virus was titered (closed circles in A) and the P protein was estimated by immunoblot (B) followed by densitometric analysis (open bars in A) as described under Methods. Syncytium in RSV-infected HCE cells. RSV infection of HCE monolayer was performed as described in Methods. At 72 h p.i. the monolayer was photographed under phase contrast . Note that the infected cells are fused together (forming syncytia) in contrast to those in the mock-infected "control" monolayer. To investigate whether RSV infection can activate cytokines and chemokines, primary HCE cells grown in tissue culture were infected with RSV, and expression of 31 different cytokine mRNA was monitored by real-time PCR as described under Methods. Results are shown in Fig. 4 whereby cytokines that were induced by RSV infection are presented in the order of increasing fold induction. These results can be summarized as follows. First, among the 31 cytokine mRNAs screened, 18 were induced. Here, we present them by their common names along with the newer systematic names in parenthesis: I-309 (CCL1), MDC (CCL22), MCP-3 (CCL7), TARC (CCL17), MIP-3α (CCL20), TNF-α, MCP-1 (CCL2), GROγ (CXCL3), GCP-2 (CXCL6), MCP-4 (CCL13), IL-8 (CXCL8), GROα (CXCL1), GROβ (CXCL2), MIP-1α (CCL3), IL-6, MIP-1β (CCL4), MIG (CXCL9), I-TAC (CXCL11) and IP-10 (CXCL10). In Fig. 4, the receptor for each cytokine is also given in parenthesis; for example, I-309 acts as a ligand and agonist for the CCR8 receptor whereas I-TAC and IP-10 both act as ligands and agonists for cells containing the CXCR3 receptor. The 12 cytokines whose mRNA levels remained unchanged are: CNTF, Fractalkine (CX3CL1), ENA-78 (CXCL5), IFN-γ, IL-1α, IL-1β, IL-2, IL-11, LIF, MCP-2 (CCL8), TGF-β, OSM and RANTES (CCL5). There was very little activation up to 12 hr post-infection, and most cytokine mRNAs peaked between 30 and 40 hr. Transcript levels of many tend to diminish at later times (after 40 hr), most likely due to cell death caused by RSV infection. In fact, no samples were taken after 48 hr as cell death and fusion, a hallmark of RSV infection, ensued around 60 hr [7, 27]. It was found that the cytokines exhibited a wide range of activation. In general, the CC chemokines such as I-309, MDC, MCP, TARC, MIP were induced modestly, ranging from 6 to 20 fold at optimal times (the upper part of Fig. 4). In contrast, the mRNA of many CXC chemokines such as MIG, IP-10, I-TAC, GROα,β and IL-8 were induced very robustly, ranging from a few hundred to a few thousand fold (the lower part of Fig. 4). Among the MIP family members, MIP-1α and MIP-1β were induced much more strongly than MIP-3α. Among the two interleukins tested, IL-6 showed greater induction than IL-8. Induction of cytokine mRNA in RSV-infected HCE cells. RNA isolated from infected cells at different times p.i. were subjected to quantitative Real Time RT-PCR as described in Methods. The relative amounts of RNA were expressed as the ratio of mock-infected control value (fold induction). Each box represents a specific cytokine as named; the cognate receptor(s) are indicated in parenthesis. Each data point is derived from three independent infection experiments with the error bar as shown. To verify that the mRNA levels translated into proteins, we chose selected members representing different regions of the induction spectrum and quantified their concentration in the media supernatant using an antibody-based assay described in the Methods. 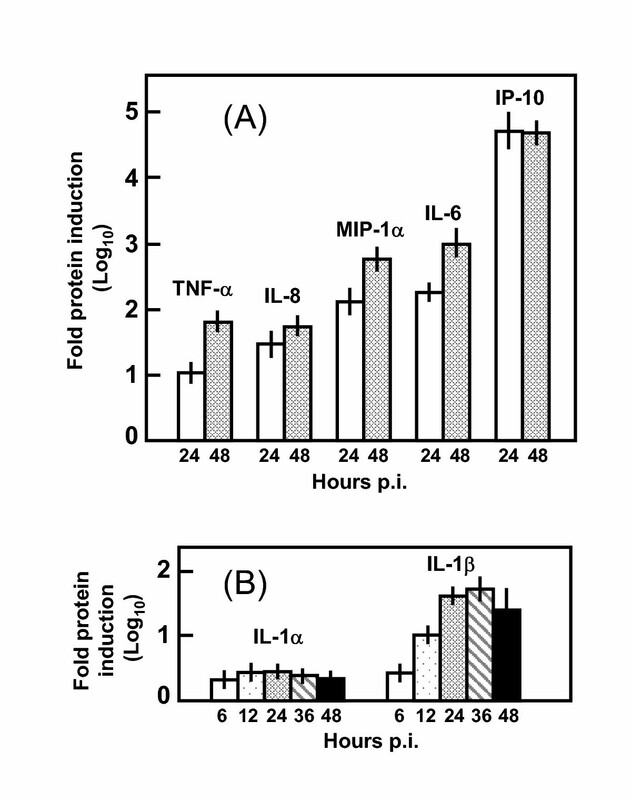 Two time points were tested, namely 24 and 48 hrs, and the results for TNF-α, IL-8, MIP-1α, IL-6, IP10 are shown in Fig. 5A in the same order as in Fig. 4 for ease of comparison. For all these cytokines, the protein levels closely paralleled the mRNA levels. Thus, RSV infection of the HCE cells leads to the elaboration of a variety of cytokines including chemokines of the CC and CXC families, but not the CX3C chemokine. Quantitation of cytokines by antibody array. Immunoblot array of the indicated cytokines were performed and fold induction over mock-infected HCE cells were determined as described in Methods. IL-1α and IL-1β were subjected to greater scrutiny with closer time points because their mRNAs were not induced when tested in Fig. 4. Each bar is derived from three independent infection experiments with the error bar as shown. Note the strong elaboration of IL-1β, contrasting the little increase of IL-1α. IL-1, a master-regulator cytokine, is often produced at the site of invasion/inflammation and then activates other cytokines including chemokines [28, 29]. IL-1β is generated by proteolytic processing of the pro-IL1β by IL-1β-converting enzyme or ICE [30, 31], which is a caspase homolog; the processed IL-1β is released and acts on surrounding cells to activate the synthesis and release of chemokines. IL-1α, in contrast, is activated mainly at the transcriptional level. Because the mRNAs of neither IL-1α nor β was elevated by RSV (Fig. 4), we tested the protein levels released in the extracellular medium at different times post-infection. As shown in Fig. 5B, while IL-1α was barely activated, IL-1β level in the medium reached its maximal concentration at 36 hr (460 pg/ml), accounting for nearly 90-fold activation over basal levels. Interestingly, IL-1β protein had an early kinetics of activation such that substantial extracellular amounts (~25 pg/ml) could be detected as early as 6 hr post-infection. We first performed immunoblot analyses to compare the nuclear levels of p65 (RelA) and p50 in the infected HCE cells with those in the uninfected ones. As shown in Fig. 6A, the quantities of both proteins started to rise at about 6 hr post-infection, and rapidly increased to about 6-fold and 10-fold above the pre-infection levels by 18 hr and 36 hr, respectively. As shown previously for A549 cells , a control transcription factor, Sp1, remained constant throughout this time. Activation of the HCE cell NF-κB by RSV. (A) Amounts of p65 and p50 subunits of NF-κB were determined by immunoblot of isolated nuclei. Note that a control transcription factor, Sp1, was not activated . (B) Functional activation of NF-κB in RSV-infected cells was measured by luciferase induction from a reporter plasmid (pNFκB-Luc) as described in Methods. Where indicated, 10 or 20 mM NAC, Na-salicylate (SAL) or aspirin (ASP) was included in the reaction. Each bar is derived from three independent experiments with the standard error as indicated. Next, in order to demonstrate the transcriptional activity of NF-κB, we employed a functional assay using the plasmid pNFκB-Luc, a specific NF-κB responsive reporter plasmid in which synthesis of luciferase is dependent on tandem promoter-proximal NF-κB sites . RSV infection of HCE cells transiently transfected with pNFκB-Luc resulted in a nearly 15-fold induction of luciferase activity over uninfected controls (Fig. 6B). No luciferase activity was detected using pfLuc, a control plasmid lacking the NF-κB sites [6, 32]. Induction of luciferase was inhibited by N-acetyl cysteine (NAC), an NF-κB inhibitor (Fig. 6B) as well as by sodium salicylate and acetylsalicylic acid (aspirin), two drugs that were previously shown to inhibit activation of NF-κB, including RSV-mediated activation in A549 cells [6, 32]. The NF-κB-dependence was further authenticated by the fact that negligible amounts (8–10%) of luciferase were produced when cells transfected with a control plasmid lacking NF-κB sites (pfLuc) were infected with RSV (data not shown). Taken together, these results demonstrate the functional activation of NF-κB (RelA) in corneal epithelial cells as a result of RSV infection. Results presented here suggest that RSV, an established infectious agent of the lower respiratory tract, may be considered a pathogen of the eye as well. To our knowledge this is the first detailed report of a direct interaction of RSV with the ocular tissue. Interestingly, RSV infection of the corneal epithelium exhibited many features observed in the infection of the lung epithelium: (i) A strong correlation between respiratory infection and the presence of RSV in the eye (Fig. 1); (ii) A productive multiplication of the virus (Fig. 2, 3); (iii) Liberation of a variety of cytokines (Fig. 4, 5); and (iv) Strong activation of transcription factor NF-κB (Fig. 6). It is to be noted that RSV growth was slower in HCE cells compared to lung epithelial cells. Whereas the virus-induced syncytium is observed in about 36 hrs in A549 lung cells , it was not seen until about 48 hrs in HCE cells. The release of progeny virions and the induction of the cytokines also followed a parallel and slower kinetics in HCE cells (compare, for example, Fig. 2 with the kinetics in A549 cells [6, 23]). These results are in agreement with a role of viral macromolecular synthesis in the activation of these signaling pathways in HCE cells. It is to be mentioned here that specific RSV strains infect nonhuman mammals such as the cattle, sheep, pig and goat, and thus, an extension of these findings may have important relevance in agriculture. The implications of the viral regulation of corneal genes are briefly summarized below. As noted in the Results (Fig. 4), a considerable number of chemokine genes of both CXC and CC families were induced in the RSV-infected HCE cells. The CX3C member, Fractalkine, was not up-regulated, and the C subfamily chemokines (Lymphotactin and SCM-1β) were not tested. The CXC subfamily  is further divided into two groups based on the presence or absence of the Glu-Leu-Arg (ELR) motif immediately preceding the first Cys residue near the amino terminus. The ELR+ CXC chemokines act primarily on neutrophils as chemoattractants and activators, inducing neutrophil degranulation with release of myeloperoxidase and other enzymes. 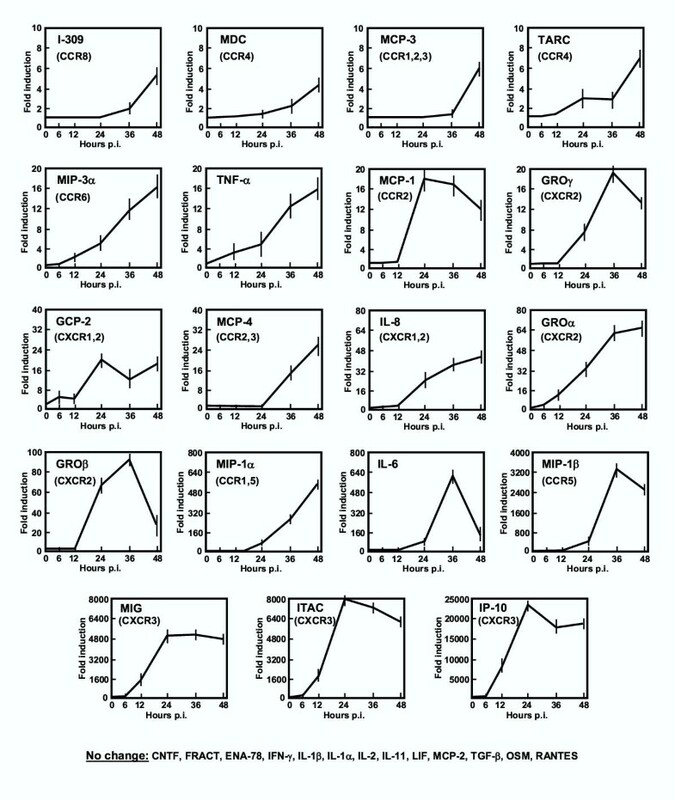 In contrast, chemokines of the ELR- CXC and the CC subfamilies chemoattract and activate T- and B-lymphocytes and natural killer (NK) cells Interestingly, chemokines that exhibited the highest induction (in the hundreds of fold) by RSV (Fig. 4) belonged to the latter two subfamilies and included three ELR- chemokines, namely MIG (Monokine-induced by IFN-γ), I-TAC (IFN-γ-inducible T cell alpha chemoattractant) and IP-10 (IFN-γ-inducible protein of 10 kDa), and two CC chemokines, MIP-1α and MIP-1β. It is also noteworthy that whereas MIG, I-TAC and IP-10 are all IFN-γ inducible , RSV infection did not activate IFN-γ from the HCE cells (Fig. 4). Clearly, these chemokines must be induced via an IFN-γ-independent pathway activated by RSV, which needs to be elucidated further. It should be noted that recent studies have cast doubt on the original assumption that expression of these chemokines absolutely requires IFN-γ. For example, IFN-γ-independent activation of MIG and IP-10 has been observed in primary human umbilical vein endothelial cells (HUVECs) in response to infection by influenza virus . Moreover, studies in IFN-γ knockout mice have revealed that in the absence of IFN-γ, IFN-α and -β are able to induce MIG in response to a viral infection in vivo . Although many chemokines can be pluripotent and exhibit redundant functions , we notice an interesting pattern in the HCE chemokines induced by RSV (Fig. 4). It appears that the some of most weakly induced ones (I-309, MDC, TARC) are agonists of CCR8 and CCR4, and therefore, likely to recruit Type 2 (Th2) lymphocytes characteristic of allergy. In contrast, the four most highly induced ones (MIG, I-TAC, IP-10 and MIP-1β) were CXCR3 and CCR5 agonists, and therefore, likely to recruit Th1 lymphocytes, characteristic of an inflammatory response . Further studies are needed to unravel how the Th1 and Th2 balance may affect the pathology of the RSV-infected eye. The significantly higher induction of IL-1β (Fig. 5) deserves special mention. Ocular IL-1, by virtue of its multipotential nature, plays a regulatory and generally pro-inflammatory role in acute inflammation of the eye . First, because the IL-1β receptor (IL-1 RII) is found on monocytes, neutrophils and T cells , the elaborated IL-1β may directly recruit these cells to the infected cornea, thus promoting inflammation. Ocular chemokines have in fact been shown to play essential roles in blinding keratitis caused by herpes simplex and Pseudomonas aeruginosa [8–10]. Second, IL-1 has the potential to activate other cytokines, including chemokines such as IL-8, GROα, and MIP-1α, many of which may in turn recruit and/or activate inflammatory cells such as eosinophils and neutrophils at later times in the infected eye [8, 9, 36–40]. Results in Fig. 4 and 5 in fact suggest that IL-1β is activated through proteolytic processing by ICE relatively early (about 6 hr) in RSV infection of the corneal epithelial cells. Because the transcription of the IL-1β-inducible chemokines, such as IL-8, GRO, and MIP were all induced hours later (beginning around 12 hours) (Fig. 4, 5), it is quite possible that they were induced, at least in part, by IL-1β. In a recent study , use of DNA microarray lead to the identification of a spectrum of chemokines inducible by RSV infection from two alveolar epithelial cell lines: A549, a type II-like cancer cell line, and SAE, a primary cell line of type I. In A549, the following chemokines mRNAs were induced: CC (I-309, Exodus-1, TARC, RANTES, MCP-1, MDC, and MIP-1α and -β), CXC (GRO-α, -β, and -γ, ENA-78, IL-8, and I-TAC) and CX3C (Fractalkine). Many of these chemokine mRNAs were also induced in SAE cells following RSV infection; however, important exceptions were MDC, TARC and MCP-1, suggesting that RSV-induced cytokine response differs between different types of airway-derived epithelial cells. The most notable differences between these airway cells and the HCE cells were the absence of induction of RANTES, ENA-78 and Fractalkine in the HCE cells (Fig. 4). Such differences may reflect the innate genetic difference between corneal and alveolar epithelial cells. In either case, just as the respiratory epithelium has been postulated to be a primary initiator of pulmonary inflammation , the corneal epithelium may also act as an initiator of ocular inflammation in RSV infection. Our conclusion should not be interpreted to mean that all conjunctivitis is caused by RSV; in chronic vernal keratoconjunctivitis, for example, RT-PCR analysis of conjunctival biopsy samples (n = 15) failed to detect RSV . As mentioned earlier, RSV infection activates NF-kappa B in lung epithelial cells; however, the status of corneal NF-κB is relatively unknown. To our knowledge, the results presented here constitute the first documentation of NF-κB activation in HCE cells following a respiratory virus infection. Gene knock out studies have shown that the NF-κB kinase (IKK) – and by inference, NF-κB itself – is essential for the development of the mammalian cornea and conjunctiva . A basal expression of NF-κB in the HCE cells was also observed in our studies (Fig. 6). Thus, it is reasonable to conjecture that the increased NF-κB activity observed following RSV-infection might lead to transcriptional induction of cytokines such as IL-8, MIP-1α, MIP-1β and MCP (Fig. 4). We previously showed that non-steroidal anti-inflammatory drugs (NSAID) aspirin and salicylate inhibited NF-κB activation and induction of a number of cytokines from lung epithelial cells . A comparable ability of the NSAIDs to abrogate NF-κB activation in RSV-infected HCE cells (Fig. 6B) raises the interesting possibility that they may also help to resolve RSV-mediated inflammation of the eye. The other avenues of potential intervention would include inhibition of specific immunomodulatory cytokine(s) by a variety of available antagonists including, but not limited to, antibodies . Antiviral-antichemokine combination therapy is in fact a new strategy worth considering as a general therapeutic approach to viral infections [6, 43]. In a recent example , combination of an antiviral (ribavirin) and anti-CCL3 was synergistic and able to prevent mortality in mice infected with the highly lethal pneumonia virus of mice, a natural mouse pathogen that is very similar to RSV and belongs to the same genus, Pneumovirus. Lastly, it will be interesting to determine whether RSV can travel from the infected outer cells of the eye to the inner layers and eventually to the respiratory tissues. Clearly, the short- and long-term effects of RSV on the ocular epithelium and their potential impact on vision and respiratory disease will open new directions in ocular immunopathology and the mechanism of RSV spread. The outer layer of the eye can be productively infected by RSV ex vivo and in vivo. Our results thus establish a traditional respiratory virus as a bona fide eye pathogen. A large battery of cytokines and NF-κB, activated in RSV-infected corneal epithelium, may play strategic roles in producing conjunctivitis, frequently found in individuals with RSV infections. We also propose that the eye may serve as a gateway of RSV infection leading to and eventually infecting the upper and lower respiratory tracts. It is obvious that interactions between the eye and RSV are relevant in the etiology and pathology of the ocular as well as the respiratory disease. Children of 2–10 years age, admitted to the Department of Pediatrics, University of South Alabama, were screened for red, watery, and itchy eyes, and the common indicators of respiratory infection such as nasal congestion, bronchiolitis, cough, and wheezing. Age-matched controls consisted of children admitted to the same hospital for unrelated reasons (such as sports injury). Sample was collected from the surface of the eye (mainly corneal and conjunctival regions) with a sterile cotton swab (Q-tip) which was then dropped into 0.5 ml PBS; this suspension was subjected to two tests, viz., PCR and infectivity assay. The collection was pre-approved by the Institutional Review Board. For PCR, 0.45 ml of the suspension was centrifuged at 120,000 × g in a table-top air-driven ultracentrifuge, and the supernatant discarded. The pellet (containing virions, if any) was resuspended in 5 μl of the following: 10 mM Tris-Cl (pH 8.3), 0.02% SDS, 0.05% Triton X-100, 0.5 mM EDTA, 2 mM DTT. To this, 30 pmole of each of the following oligodeoxynucleotide primers were added [25, 43]. For RSV: 5'TGTTATAGGCATATCATTGA3'; 5'TTAACCAGCAAAGTGTTAGA3' (221 bp product); for glyceraldehyde 3-phosphate dehydrogenase (GAPDH): 5'CCAAAAGGGTCATCATCTCTGG3' and 5'ATTTGGCAGGTTTTTCTAGACGG3' (417 bp product). Multiplex RT-PCR analyses have earlier revealed that the RSV primers, corresponding to the sequence of the fusion (F) glycoprotein gene of RSV, do not amplify any of the common viral and bacterial agents of acute respiratory infections [26, 45]. The mixture was heated at 95°C for 5 min and rapidly chilled in ice. To the annealed RNA-primer mixture the following were added: 2 μl of 5 × RT buffer [250 mM Tris-Cl (pH 8.3), 375 mM KCl, 25 mM MgCl2, 50 mM DTT], 0.5 μl RNasin (20 units), all four dNTPs (final concentration 1 mM each), M-MLV reverse transcriptase (200 units, 1 μl), and the volume was made up to 20 μl. The reverse transcription reaction was incubated for 30 min at 40°C. PCR was reconstituted in the same RT reaction tube by the addition of an equal volume (20 μl) of buffer containing 20 mM Tris-Cl (pH 8.3), 50 mM KCl, 2 mM MgCl2. PCR was performed for 40 cycles with the following parameters: 94°C, 2 min (denaturation); 48°C, 2 min (annealing); and 72°C, 20 sec (elongation). An initial melting step (also to inactivate the RT) of 94°C, 5 min and a final extension step of 72°C, 30 sec were added to the beginning and end, respectively. PCR was initiated by hot-start, i.e., by the addition of 2 units of Taq polymerase after the first 94°C step. The product (221 bp) was analyzed by standard agarose (0.8%) gel electrophoresis followed by staining with ethidium bromide. For infectivity assay, 0.05 ml of the PBS suspension was directly added to each well of a 6-well HEp-2 monolayer at 30% confluency. The cells were then incubated for 3 days and routinely observed under microscope for syncytia formation, a hallmark of late-stage RSV infection. Once syncytia were recorded the monolayer was scraped off, the RSV-infected cells were spun down, and the pellet resuspended in SDS sample buffer . 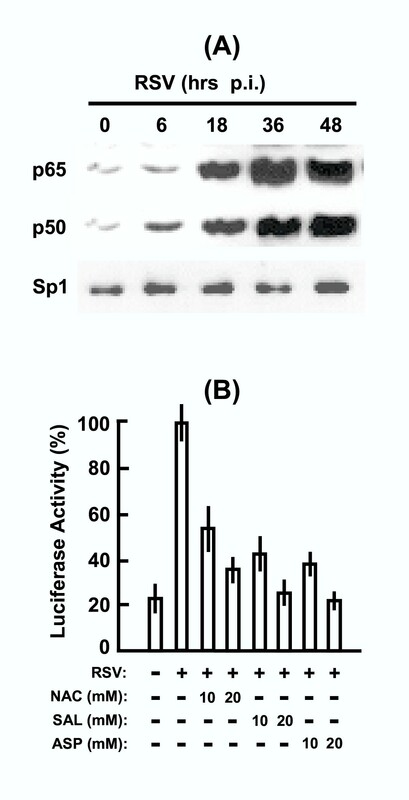 Portions of the sample (about 40 μg total protein) were resolved by SDS-PAGE followed by immunoblot analysis using rabbit antibody against the P protein of RSV  and anti-rabbit secondary antibody raised in goat. The Super Signal Ultra chemiluminescence procedure (Pierce, Rockford, IL) was used for detection of the signal as described previously . Normal eyes from human donors, free of known ocular infections, were purchased from National Disease Research Interchange (Philadelphia, PA). The corneal epithelia were isolated and the cells were dispersed and grown in monolayers essentially as described [36, 37]. Cells in this work were passaged no more than 4–5 times. When the monolayer reached a confluency of about 70%, RSV was added at a multiplicity of infection of 3.0 using standard procedures described earlier [6, 26]. The HCE monolayer was infected with human RSV (Long strain) . In all infection experiments described in this paper, control cells were "mock-infected" with a 120,000 × g supernatant of the viral preparation; such supernatants were previously shown to be free of detectable infectious virions . The inoculum of human RSV was grown in HEp-2 cells and purified as described [6, 47], and progeny virions liberated from infected HCE cells were titered on HEp-2 by standard serial dilution and plaque counting [7, 48]. For Real Time PCR experiments, RNA was isolated from RSV-infected HCE cells at 6, 12, 24, 36 and 48 h post-infection and the first-strand cDNA was made using the GeneAmp RNA PCR Core kit (Perkin Elmer-Applied Biosystems). Primers are designed by the Beacon Designer software v 2.13 from Premier Biosoft. Real Time PCR was performed on the iCycler iQ Quantitative PCR system from BioRad Laboratories (Hercules, CA) using the iQ Sybr Green SuperMix. Gene expression measurements were calculated using the manufacturer's software; GAPDH was used as an internal control. Cytokines released in the culture media supernatant were assayed by the TransSignal Human Cytokine Antibody Array 3.0 from Panomics (Redwood City, CA) according to the manufacturer's protocol. Briefly, cytokine-specific antibodies were supplied immobilized on a membrane in an array configuration. Appropriate dilutions of the infected cell media were incubated with the array membrane and the captured cytokines were detected with a mixture of biotin-labeled anti-cytokine antibodies followed by streptavidin-HRP. The chemiluminescence (ECL) of the array dots was developed by the Pierce kit mentioned earlier and digitally captured and quantified using the Fujifilm LAS-1000 system and the Image Gauge 4.0 software. IL-1α and IL-1β were quantified by ELISA, using standardized assay kits from R&D Systems (Minneapolis, MN). The various kinds of NF-κB analyses were carried out as described previously [6, 23]. Briefly, lysis of transfected and/or RSV-infected HCE cells and preparation of nuclear extracts were carried out essentially as described previously. Immunoblot analysis of 100 μg of nuclear extract was performed using rabbit antibodies against Sp1 and the p50 and p65 subunits of NF-κB (Santa Cruz Biotechnology, Santa Cruz, CA) . The NF-κB reporter plasmid (pNFκB-Luc) was constructed by cloning an additional synthetic NF-κB element (5'GGGGACTTTCCC3') into the plasmid pBIIxLuc by insertional mutagenesis using the Megaprimer method . The NF-κB-unresponsive plasmid, pfLuc, is missing the NF-κB response elements, but is otherwise identical to pNFκB-Luc [6, 32]. All plasmids were transfected into HCE cells using Fusgene (Roche Molecular Biochemicals, Indianapolis, IN) according to the manufacturer's protocol. At 15 hours post-transfection, RSV was added at a multiplicity of infection of 3, and at 18 h thereafter, processed for luciferase assay as described . Where used, NF-κB inhibitory drugs were added to the cells at the same time as the virus . This research was supported in part by a R01 grant (EY013826) from the National Eye Institute and by a NRSA Postdoctoral Fellowship (F32 AI049682), both from the National Institutes of Health, USA. VB did all the major experiments; NEG and TC carried out the real-time PCR assays; BE collected the patient samples; JEO and RNL offered expertise in the study design, isolation and growth of corneal cells, and selection and assay of the cytokines; SB conceived and guided the project, and wrote the paper. All authors read and approved the final manuscript.